The application process for getting ERASMUS+ support from the University of Bremen was very easy, also because this period was a prolongation of my first stay in Stockholm. Any important information which is necessary for the application can be easily found at the homepage of the University of Bremen. Still I advise everyone to start with the application as soon as possible because a lot of documents are needed. Especially the documents that have to be filled in by the internship place abroad might take some time since a lot of detailed information is requested. Also the application letter itself and the CV should be done carefully. Once the application was done the processing was carried out very fast by the University of Bremen. Finding an affordable place in Stockholm is difficult, especially if you are not a student studying but doing an internship there. Still there are many ways to find an accommodation in Stockholm. I can advise you to join Facebook groups like “housing in Stockholm” since a lot of offers are posted there. Still you have to be careful and never ever transfer any money to a bank account before you have a contract – a friend of mine was fooled and lost a lot of money. Another possibility is to apply for a place at KI housing. They offer different accommodation options and you might be one of the lucky ones getting a place there. Since Sweden does have different renting laws than Germany there is no real website like “wg.gesucht” but still you might find some attractive offers at a website called “blocket” (nowadays also available as an app). It is very common that families or couples rent a room of their apartment, which is often not that expensive and you can get to know the Swedish style of living. Another option is to apply at the website “housing-anywhere”. Students might rent out rooms on that webpage for an affordable price. Depending on one knows when one will go abroad you could also try to rent out a room through SSSB. It’s a website renting out rooms to students that are enrolled in any university in Stockholm. The one with the highest amount of waiting days receives a room so it’s worth it to register at the website as soon as possible. In general, you should not be scared if the location of the advertised house is fare away from the city centre. The public transport system in Stockholm is one of the best I’ve known so far. Usually all small villages around Stockholm are well connected to the city centre. I myself was very lucky to find a small apartment close to KI due to personal contacts. If you are lucky and find a place in Stockholm itself I can recommend to live in Vasastan or Södermalm – both are student quarters. If you start studying at Karolinska, then it is nice to live in Vasastan or Solna since they are the closest neighbourhoods to KI. All in all, I advise you to start the apartment hunt as soon as possible because this was one of the most difficult things for me and a lot of friends of mine since “cheap” (rent is starting from about 4000/month) accommodations in Stockholm are hunted like hell. Performing my research internship at the famous Karolinska Institute was the best studying experience I had so far. I have learned so many new methods and techniques in a short period of time and the content of my project was perfect for my interests in parasitology and neuroscience. But the greatest benefit was to get to know all those great researchers. The working atmosphere at KI is really great. People come from all over the world so I got to know a full flower bouquet of cultures, religions and traditions which I myself enjoyed a lot. But also the Swedish way of living is implemented in daily life of KI. Never in my life had I drunk so much coffee than here since having a “fika” (Swedish coffee break) is THE thing in Sweden, especially during the dark winter months. But also Swedish festivities such as Santa Lucia and Christmas are celebrated at KI which contributes to the great atmosphere. Since Sweden has less than 10 million inhabitants, English movies and soaps are not synchronized and every Swede is able to speak English very well. Studying at KI helped me a lot to improve my English language, since everyone speaks English in this very international institute. I also grew personally and my knowledge of science did so too thanks to my great professor and working group. If you want to do research at the cutting edge surrounded by great researchers then KI is the perfect place for you. Especially the new building in Solna called “Biomedicum” is great and offers many modern core facilities to ensure modern sophisticated research. The different working groups and departments offer a very broad catalogue of great biomedical research – every taste and interest are covered. I am very grateful for the opportunity to study at KI and being part of this fruitful and very dynamic research environment. As soon as you arrive at the university, I can only advise you to join one of the student unions in order to receive a student ID. This allows you to buy reduced tickets for the public transport called SL. Another option is to rent a bike, which you can do between March and September. There are stations for the city bikes all over the city and renting out a bike is very cheap and convenient during summer time. SL even offers a transportation to the airport Arlanda, which is convenient since using the private Flygbusserna or the SL train is much more expensive. Also, I can recommend you fly with SAS in case you are under 26 years old since they offer a youth price that allows you to fly for little amount of money. 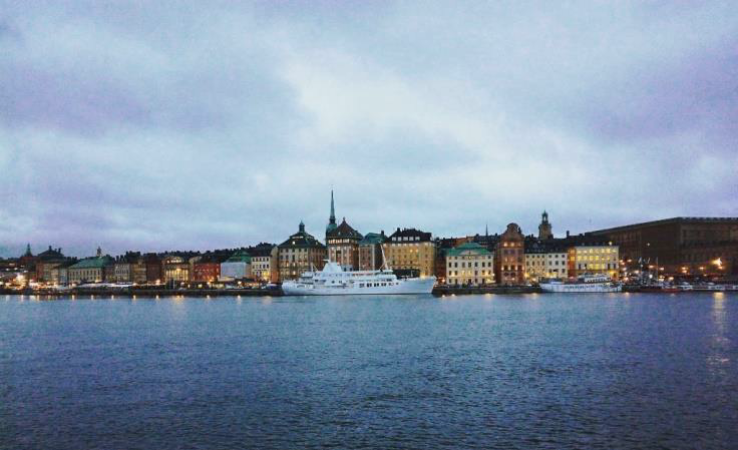 Once I arrived in Stockholm I directly fell in love with this beautiful city. All the small islands surrounded by water and the beautiful woods make it a beautiful city to stay. There is no better thing than to explore the nature around Stockholm and the city itself which has so much to offer. If the weather is nice then there is no better thing than going out into Sweden’s beautiful nature like the skärgården close to Stockholm, which is the best place to stay during long warm summer days. Thanks to ERASMUS+ support I could see a lot of impressive places like Björnö Naturreservat where your soul can breathe and relax. Stockholm itself has many small lakes such as Brunnsviken, that are nice to swim in during summer time. The city itself has many things to offer and even one year is not enough to discover everything. There is the beautiful Gamla Stan with all its beautiful ancient buildings and the castle of the royal family. Normmalm is busier than most of the other islands but still I loved the area around Vasastan. There is nothing better on a Sunday than having a coffee in one of the beautiful cosy coffee stores like Non Solo Bar or Pascal and hitting a second hand store in Vasastan or Södermalm. Also, there is a beautiful forest which is very lovely for having a walk through the snow or going sledding during winter times. If you want to study in a nice atmosphere during the weekend I can only recommend you the lovely Stadsbiblioteket also located in Vasastan. Another island called Djurgården with its nice museums is always a good place to stay when weather is grey and of course it’s beautiful to go for a walk during summer time and maybe visit the zoo Skansen where you can see local animals from Swedish wildlife. One of my favourite museums is Moderna museet which is located on a very small island in the heart of Stockholm. Entrance is free and it has to offer a lot of nice exhibitions and discussion and exploring the island is also worth it. Another amazing museum is Fotografiska that exhibits great photographs from different artists. If you wanna have a lovely summer evening than there is no better thing than going to Södermalm, buy a pizza close to Zinkensdamm and go up the hill at Skinnarviksberget and just enjoy the view and sunset over whole Stockholm. Södermalm itself is a very student-friendly area and a good place to go out at weekend’s nights or just for a nice meal. Also, the big park close to Fridhemsplan is a nice spot to stay during summer time. Swedes themselves are very friendly and helpful persons and they all speak English very well, so there is only little communication problems here. I cannot think of any aspect in this town that is keeping you from staying here and loving it. To put it in a nutshell I am so grateful for the support of ERASMUS+ during my stay in lovely Stockholm. It was one of the greatest experiences in my life so far and I do not regret any second of it. During my stay I grow both personally and also as scientist due to my wonderful time at KI and the best working group ever. I felt nothing but home during that time which is why I am going to stay for my PhD here since I cannot say goodbye yet. Thank you ERASMUS+!